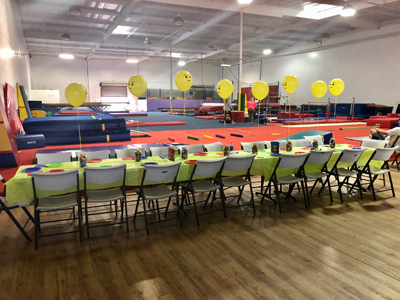 California Gymnastics is a great place to celebrate your Birthday! Our coaches will guide the party goers through a fun gymnastics circuit including games, zip line, foam pit and bungees on trampoline. You will have the whole gym to yourselves allowing you to decorate or bring food, cake, etc. If you bring a pinata, we will gladly set it up for you. Birthday Parties or your special event. CG offers multiple camps thoughout the year. Campers will enjoy the most fun aspects of gymnastics. Daily activities include games, trampoline, bungees, foam pit and skill developement on the individual events.